Click the Lightbox>Fibers button to quickly load a FiberMesh preset from Lightbox. Press Open to load a FiberMesh settings file that you have saved to disk. Press Save to save the current FiberMesh settings to a file on disk, so that yopu can reload it at a later date. By clicking on the Preview button, ZBrush will generate a temporary FiberMesh based on the current settings, explained below. While in this state you can change your Fibers settings and see the results updated in real-time. You may also generate a render with BPR to evaluate your final result. While Preview is active, rotating or moving the model will temporarily hide the fibers until you release the mouse button. Changing your support model’s topology, Masking or PolyPainting information will disable the Preview. The fibers will disappear until you press Preview again. To completely turn off the fibers that are being displayed click on Preview again. Generates the FiberMesh as a SubTool of to the support mesh. At this stage, the fibers will become a SubTool which may now be sculpted, styled and painted. Except for the BPR render options for fibers all other The Fibers sub-palette settings will not affect a FiberMesh once it has been converted to a SubTool. These settings only work in Preview mode. Defines the maximum number of fibers generated. ZBrush will populate your model based on the other settings below. Values are in thousands of fibers. Note: A human head typically has between 80,000 and 140,000 hairs, depending on hair color, thickness and baldness. The DeV slider will adjust the density variation to the fibers when they are created. Defines how strongly the Mask influences where fibers are to be created. The higher this slider, the more ZBrush will use the Mask as a guide to populateing fibers. If there is a less intense Mask on your surface then ZBrush will populate fewer fibers with a shorter length. This slider’s effect is also calculated with the By Area slider so that the two sliders complement each other. By Area: Defines the fibers based on the underlining mesh topology. Fibers on large polygons will be longer and thicker than fibers on smaller polygons. This feature is important because it also considers the shape of the FiberMesh support surface and produces more natural fibers on models with orientation variations and breaks in the shape. Imbed: Defines if the root of the fiber will be directly on the underlying surface, hovering right above the underlying surface or imbedded deeper into the surface. This latter result is useful if you create your fibers on a low resolution surface and later will be subdividing the support mesh (causing it to contract slightly). Imbedding the fibers will ensure that they remain “attached” to the surface rather than end up floating above it. Length Profile: This curve affects how the segments along the fibers will be propagated. The default curve will generate a constant length for each segment. Modifying the curve can do such things as concentrating the segments at the Fiber’s root or tip. This setting can affect the result of other settings. For example, if you wish to have a Revolve setting concentrated at the tip of your Fibers, you would want to have more segments there than at the root. Length: Defines the overall length of the fibers. The individual length of each fiber is then modulated by the Mask intensity and the By Area slider settings. Coverage: Increases or decreases the density width of the Fibers. LeV: The LeV slider will give length variations to the fibers. Width Profile: This curve affects the width along your curve, letting you creating custom profiles. An example of how Width Profile curve affects Fibers. Note: Because of this addition, the Root/Tip Scale and Flare settings are redundant and have been removed. Gravity: Causes the ends of the fibers to droop. The direction of the gravity is controlled by position of the model relative to the canvas’ working plane. For example, if you loaded the DemoHead.ZTL facing down with the top of his toward the camera the fibers direction will be dropping toward the front of the face. Note: It’s important to first set your model’s orientation before setting or updating the Gravity value. Horizontal and Vertical Tangent: Alters the direction of the fiber by changing the Normal value of the support mesh in a vertical or horizontal direction. These settings are primarily used for generating fibers on top of a FiberMesh SubTool. 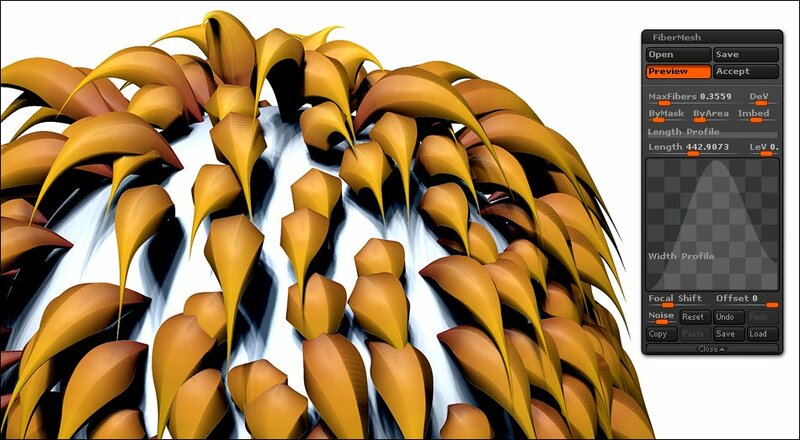 Both settings can be helpful to create feather-like fibers by combining a fiber on the top of an existing FiberMesh. As this setting uses the polygon and the vertex order of the support mesh, it works better with FiberMesh objects than on normal meshes. Clumps: Attracts the tips of fibers together when grown from the same support polygon. Moving this slider to a negative value will separate the tips more such as with hair plugs. Base Color: Colors the base of the fibers using the color selected in the corresponding color patch to the slider’s left. Tip Color: Colors the tip of the fibers using the color selected in the corresponding color patch to the slider’s left. Morph Target Guided: Generates Fibers by comparing the current state of your tool to a previously stored morph target. 1. Select your Tool or SubTool. 2. Store the Morph Target by clicking on Tool >> Morph Target >> StoreMT. 4. Click Tool >> Morph Target >> Switch. 5. Activate the FiberMesh Preview using Tool >> FiberMesh >> Preview. the difference between your model’s current state and the Morph Target. Profile: Defines the number of sides for each fiber. The default value is 1 which will create a strip of one sided flat polygon(s). Increasing the value to 3 or 4 will create a triangle shaped fiber that is capped off at the end. Increasing this value to higher numbers will create rounded fiber sections, but it will also drastically increase the FiberMesh polygon count. When the value is adjusted higher than 1, ZBrush will warn you that you can alternately use the BPR Sides setting located in the Fibers sub-palette to increase the number of sides at render time rather than having to work with a high number of polygons during sculpting. We recommend keeping this value at 1 and use the BPR Render options when creating fibers that are intended for hair, fur, fabrics for clothing, and etc. Only use Profile when you’re going to be exporting your FiberMesh. Segments: Defines the number of segments along each fiber’s length. (Number of polygons per fiber per side.) A high value will create smoother angles but will also increase the total polygon count. Fast Preview: This allows you to modify and sculpt the fibers with more ease as ZBrush will only display the overall shape of the each fiber. Note: Some settings like Flaring are not visible when in Fast Preview mode. The Fast preview mode isn’t restricted to the current Fiber preview, but to the selected FiberMesh SubTool after its creation. Preview Fiber Visibility (PRE Vis): Defines the percentage of fibers to display when the Fast Preview mode is enabled. This can be used to speed up performance while working with your FiberMesh. Fibers that are invisible due to the Pre Vis value will still be affected by sculpting and painting. ZBrush can export your sculpted FiberMesh object as guide curves to be used with the Hair and Fur system in the software of your choice. Root and Tip Anisotropic: The Anisotropic value affects the surface normal of the root of the fiber or of its tip. Increasing these values will produce more natural-looking fibers. When these values are increased, the normals of the fiber will follow a path that allows them to lay flat on top of each other. Note: These settings are different than the material Anisotropic settings as they affect the geometry surface aspect itself. As a result, you don’t need to change this setting in the Material settings. It is important to consider this point as some materials like MatCaps don’t have Anisotropic settings. Subdivision: Defines the number of times each fiber should be subdivided at render time. This operation subdivides the fiber in the same manner as traditional subdivision smoothing and makes the fibers look more natural. Sides: Defines the number of sides that each fiber will have when rendered. This setting is only available when the Profile slider value was set to 1 at the time the fibers were created. Radius: Increases the radius of the fibers when they are rendered, giving them volume without needing to increase the amount of actual geometry. Press to export the fibers. When exporting your fibers as a vector displacement map, ZBrush will export an OBJ file and a vector displacement map corresponding to the extrusion of the Fibers.